Update: The main parking lot at Mental Health Services was set to close on Monday, February 13, to accommodate construction of the new access road to the Forensic Mental Health Admitting Entrance at Providence Care Hospital. Due to delays in construction, the main parking lot will reopen (effective immediately). The closure is delayed until further notice. We apologize for the inconvenience that this further delay has caused, and appreciate the effort that has been made to park in alternate lots on site for the closure. 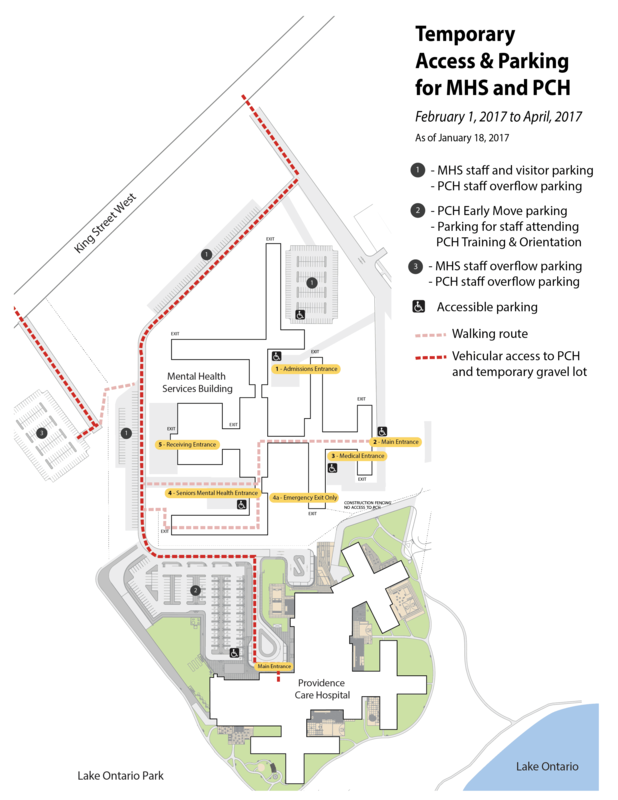 Beginning February 13, 2017 the main parking lot at Mental Health Services (MHS) nearest the main entrance will be closed permanently to accommodate on-going site construction for Providence Care Hospital (PCH). The existing main entrance parking lot will be reconfigured over the next several months to build the new access road to the Forensic Mental Health Admitting Entrance at PCH in advance of the move in April. The main parking lot will be closed by the end of day Sunday, February 12, 2017. Cars parked in the lot when it is closed will be able to leave, however drivers will be redirected to other available parking on the site once the main lot is closed starting Monday, February 13, 2017. Individuals who regularly park in the main lot will be required to park in the surrounding lots at MHS (see map below). The Main Entrance and Main Entrance loop will continue to be available for regular pick-ups and drop-offs and general access to the building. The accessible spaces directly across from the entrance will continue to be available as well.